↑ Frédéric, "Tōhoku" in গুগল বইয়ে Japan Encyclopedia, পৃ. 970,, p. 970. ↑ Frédéric, "Morioka" in গুগল বইয়ে Japan Encyclopedia, পৃ. 661,, p. 661. 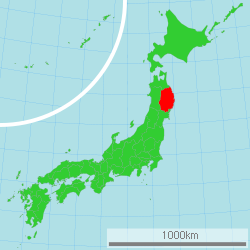 ↑ Frédéric, "Provinces and prefectures" in গুগল বইয়ে Japan Encyclopedia, পৃ. 780,, p. 780.